Well it has been a week since we arrived at Lake Keepit for Deb's awesome Paperarts retreat and I am now recovered. We had the best time and Nerd Night was a blast...unfortunately I have to report that I am the nerdiest of them all and apparently by quite a way. My boys will be so proud of their mumma ..mmm maybe not. At camp as well as doing four classes with Ngaire and Jill...I scrapbooked, and ate and chatted and scrapbooked some more. It was amazing..so great to recharge the spirit even if the body came home very very tired. This is the first layout I have to show you. 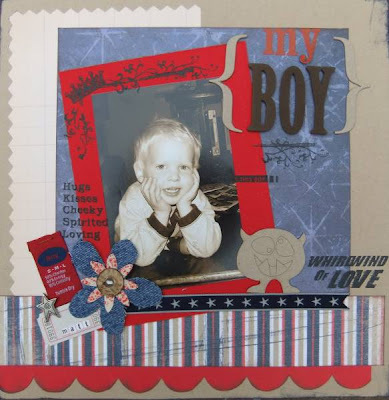 It is for the Scrap the Boys challenge to use flowers on a boy layout. My flower was handcut from some denim fabric and layered with a Making Memories canvas flower and vintage button. I thought this challenge would be hard but I ended up using flowers of some description on almost every layout from the weekend. Photo is my gorgeous Matman looking angelic (ha ha). Used up an old fabric frame and rubons on here too and that cute fabric tag is from Junkitz. 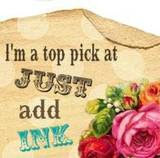 now, seriously..we need to do more scrapbooking days...just for fun like..ok?? Looking forward to a road trip to barraba..too, K? ?